With a diameter of 35 mm and a case thickness of 8.5 mm the Nomos Orion 35 Rose watch was created for those with smaller wrists. Beautiful galvanized silver-plated dial with rose color added and gold-plated hands and applied indices. The dial contains an off-center subsidiary seconds dial. The dial is first sand blasted, then bathed in silver rose to provide the unique Nomos coloring. The baton hands are made of polished steel and then gold plated. 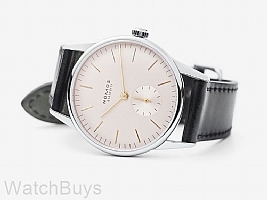 Nomos is known for many good things including their straps and this watch is no different. This watch features a black Shell Cordovan leather strap with polished tang buckle.